As of 2 p.m. Friday, August 31, 2007, 20 bills remain on the Governor’s desk for action by the midnight Saturday deadline. Any bills not signed or vetoed by then become law Sunday, September 2, 2007. We plan to process Saturday and Sunday the last days of bill signings. Any bills signed Friday evening will be posted on this site around 3 pm on Saturday. Any bills that might become law without the Governor’s signature might not be processed until after the Labor Day holiday, however. Our “pending on the Governor’s desk link” might still show those 20 bills until Tuesday, but the “laws enacted in 2007” link will update as soon as the bills are processed here. 20 bills remain on the Governor’s desk, out of the 208 pending at the end of session. You can keep up with bills pending on the Governor’s desk by clicking here, and with laws enacted in 2007 here. (that list is totally updated) The Governor has until midnight, September 1, 2007, to act on bills. As of 10 a.m. Friday, August 31, 2007, 34 bills remain on the Governor’s desk for action by the midnight Saturday deadline. Any bills not signed or vetoed by then become law Sunday, September 2, 2007. We plan to process today, Saturday, and Sunday the last days of bill signings. Any bills that might become law without the Governor’s signature might not be processed until after the Labor Day holiday, however. Our “pending on the Governor’s desk link” might still show those 34 bills until Tuesday, but the “laws enacted in 2007” link will update as soon as the bills are processed here. 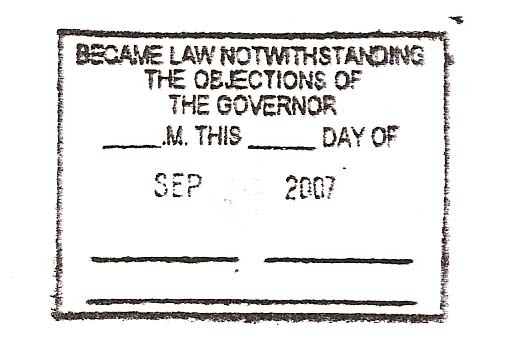 Being an efficient bureaucracy, we ordered a rubber stamp for this in 1997, which has lain unused in a drawer for a decade. 34 bills remain on the Governor’s desk, out of the 208 pending at the end of session. CAVEAT: We are not sure whether the table has been updated to include later amendments to a listed local act. On our list of things to do for next year is to Shepardize the table to update it. Governor Easley has vetoed House Bill 1761, the Job Maintenance and Capital Development Fund. The bill has been returned to the House of Representatives for further action. A copy of the veto message is here. Unlike the United States Constitution, there is no pocket veto, the Governor must call the General Assembly back into session to allow it consider overriding the veto. The Governor must reconvene the 2007 Regular Session to start no later than Tuesday, September 11, unless by that date a majority of members in each house sign a petition declaring the a reconvened session is not necessary to reconsider passage of the bill. At a reconvened session, the only bills that can be considered are those that have been vetoed. Information on past vetoes is here, more information on reconvened sessions here. You are currently browsing the Drafting Musings blog archives for August, 2007.